You paid more for luggage than the actual price of your airfare, you shoved your over-large stroller through the security checkpoint, and you watched in resignation as your child did laps around the moving walkways. As the plane boards, most parents suffer some degree of anxiety about the potential public humiliation they will endure if their child throws a tantrum on the flight. Whether your flight is a puddle-jump across the state or an epic trans-Pacific voyage, you’ll need a strategy to keep the little one(s) entertained. Contrary to popular belief, flying with babies is a piece of cake. From their perspective, life on an airplane couldn’t be better. A bottle, a warm lap and your undivided attention pretty much equals baby-nirvana. Add a few colorful toys, some Baby Einstein flash cards, the plastic drink cup with a few ice cubes, and your baby should be relatively content. One thing that can throw a wrench into this idyllic picture of a happily cooing baby at 30,000 ft. is ear pain. Be sure to read this post for tips to avoid ear problems. If your little one is mobile, keeping him happy might be more of a challenge. Kids don’t like to be confined, and the airline seatbelt can be the first hurdle in avoiding tantrums. Forewarned is forearmed. Before boarding the plane, explain that we need to wear seat belts on airplanes, just like we wear seat belts in the car. 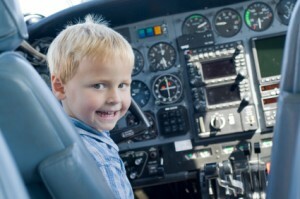 Tell your child about the fasten seatbelt sign. Even when it’s not lit, they’ll want to be safe, respectful travelers by staying in their seats. Snacks and entertainment are synonymous when it comes to air travel. Pack some healthy snacks like dried fruit, 100% fruit leather, shelled sunflower seeds, pumpkin seeds and apple slices. High glycemic snacks like Goldfish, crackers, pretzels and fruit cereal bars cause a rapid rise in blood sugar and are devoid of nutrients. More importantly, they can create the same hyperactive behavior as sugar. Use these types of treats sparingly. When you want to give your child a special treat, make it special. A colorful sucker, brightly wrapped piece of chocolate, etc. is more impactful than Goldfish when it comes to travel treats. You can also extend the activity of eating by making a Cheerio necklace strung on cherry licorice strands or incorporating dried fruit into a game of bingo. When it comes to packing toys, less is more. You’ll want to avoid toys that make noise, take up a lot of space, have many small pieces, or make a mess. Some travel favorites include lace-up toys, magnetic games with larger pieces, triangle-shaped crayons, ColorWonder products by Crayola, and Namits (laminated game cards on a ring). If your worst fears come to fruition and your child has a meltdown, flash your sweetest smile and ask your spouse if he wouldn’t mind keeping an eye on the little cherub while you make trip to the restroom. Just don’t mention that your trip will include a detour past the flight attendant for a quick glass of wine! Great tips. We fly with our 3 yr old this week, and I am going to try the cheerio/licorice suggestion. Sounds tasty and fun! How was your trip? If you have any pictures or stories you’d like to post, I know other parents would love to see them! Can’t wait to travel this spring. I am surely trying the cherrio necklace! I think the boys will love it and keep their attention! When is your trip? Are you going over spring break? A few notes on the Cheerios and licorice rope necklace trick. First of all, licorice rope isn’t easy to find these days! I found some organic red licorice by Candy Tree on Amazon.com. Secondly, some Cheerios don’t easily fit on the rope, so check before you go to make sure yours to. And third – bring hand wipes. This project is fun but sticky!